Facing many challenges in a modern society, young students not only need to develop their abilities, but also need to interact with others and care for society. This project emphasizes on cultivating five major literacies, namely ethics, democracy, science, media and aesthetics. Through diversified educational methods, the project hope to inspire students to explore public issues, learn actively, and change the conceptual knowledge into practice and actions in their daily lives. For students, it is an educational process from “I” in my own life to “we” in our society. They should not only improve themselves, but also care for the surrounding environment, participate actively in society, and enjoy and experience the beauty of life together. To cultivate modern citizens, the integration of both general education and professional training are needed. Over the years, general education of college level has established a good foundation in Taiwan. It is hoped that more interdisciplinary faculties will join and work together to improve higher education through experience sharing. As a bridge for various departments, schools and teachers, this project aims to promote “Cultivating Citizens’ Core Competence” and hopes to “fertilize” the ground of education and “cultivate” modern citizens. The purpose of this project is to accomplish two key tasks of higher education. The first is to “cultivate” student’s talents with innovative and interdisciplinary capability as well as integrated knowledge; the second is to improve the teaching quality of higher education. It aims to promote competence-oriented teaching, practice problem-solving-based learning, put learners centered, and to create campus as a “life and learning circle”. Through developing new courses and supporting learning environment, we hope that students’ capabilities of self-reflection; interdisciplinary knowledge integration and innovation can be cultivated, so as to improve their overall strength and competence. This project is carried out through three sub-projects to achieve the goal. The first is “the project of cultivating citizens’ competence” which emphasizes on school system and environment; the second is “the project of improving the citizens’ core competence courses” which promotes innovative and integrated courses; the third is “the promotion project” which focuses on faculty development. Viewing “school” as one unit, this subject aims to create education environment for cultivation of citizens’ competence as a whole, stress cooperation between administration department, student affairs, general affairs, etc., and build a multiple learning platform. This subject emphasizes the establishment of the environment suitable for learning and activating diverse learning styles. 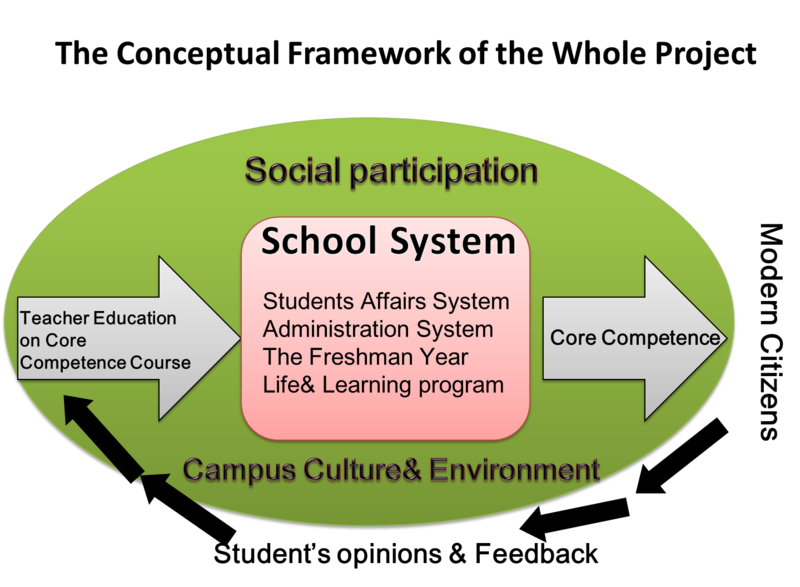 In the aspect of the environment suitable for learning, the project stresses on “the freshman year” and “life and learning circle” and integrates both formal and informal learning activities in campus. In the aspect of e-learning aids, the project coordinates the information tools on “the improvement of the school-wide map learning” ,hopeing to change the passive mode of learning and adopt multiple attempts and diverse modes of learning so that students can step out of the classroom and understand what a university is about and what are the ways of self-directed learning in the university. In terms of courses, the project also stresses on the “core curriculum of general education”, “social participation learning” and “integrating core competence into professional courses, in the hope that the spirit and content of core competence can be integrated into various professional areas. It also encourages discussion of local social issues in the curriculum design so that students can put what they have learned into practical use to meet social needs. Besides, the project emphasizes the importance of establishing a healthy and supporting structure in the school to empower teachers and secure students’ learning outcome by effective assessment methods. This project encourages teachers to cultivate students’ core competencies in ethics, democracy, science, media and aesthetics through the general education courses as well as through the cooperation of general courses and professional courses. Through course group cooperation mechanism, the project aims to foster group teaching and conduct integrated curriculum between general education and professional fields. 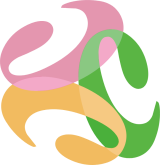 This project encourage three types of proposals which include type A, B and C. Type A is the citizens’ core competence group class, which is divided into “the general curriculum groups” applied by a number of teachers that set up the general education courses as well as “the interdisciplinary curriculum groups” applied by a number of teachers that set up professional courses and general education courses according to nature. Class B is the single course of general education. Lastly, type C is the partners’ group class led by senior faculties, whose courses have been selected as excellent courses. This plan promotes the project mainly through workshops, forum and reading clubs for teachers. Experts are invited to elaborate issues such as the concept of modern citizens’ core competencies, the integration of general education and professional education, high-quality curriculum management strategies and curriculum design. Forums and roundtable discussions are also conducted. Since 2011, the project conducted group meetings themed “classic translations forum of general education”, with topics discussed including the integration of professional education and general education courses and sharing the enlightenment of Western general education reform. Since 2012, the project conducted group discussions using “The World Cafe Roundtable Discussion Model” to explore “the connotation of modern citizens’ core competencies” so that teachers can obtain an interdisciplinary in-depth understanding, and clarify the definition, concept and implications of modern citizens’ core competencies. The activities are designed to empower teachers and strengthen their capabilities of course design , teaching skills and curriculum planning for citizens’ core competence education. By group practice, and tailor-made model and supports from experts and peers, the workshops provide new ideas through experience sharing. The content of workshop included topics on “university education and citizens’ core competence cultivation”, “learning motivation and teaching strategies” and “learning evaluation and effectiveness”. Besides, innovative courses like “action-oriented and problem-solving demonstration teaching” were also arranged. The workshops were further divided into A and B types according to objectives and background of participants. Type A focused on the “systematic course design and teaching skills” which integrated the five major qualities of citizens’ core competencies and training of the nine teaching steps relating to course design. Type B included “the discussion of question awareness and citizens’ core competencies”, “teaching objectives and unit planning”, “the design and compilation of course plans” and other sub-topics. The project carried out the specific remaking and creation of students’ customized courses and invited teachers who once won awards for excellent course to share their experience. The project aims to facilitate faculty development through formation of professional community and promote intercollegiate collaboration. A book series of “General Education” from a translation project funded by the Ministry of Education was studied starting from 2011. In order to strengthen the operation of the book reading club, expand its scope as well as facilitate the development of the professional community, the project adopted the model of “book club + teachers’ group”. Senior faculties were invited to lead clubs and regularly join several professional communities scattered around the Northern, Central and Southern parts of Taiwan. A survey was conducted to follow-up teachers who participated in the “citizens’ core competence course and teaching skills workshops”. Teachers were asked whether they made any specific adjustment in implementation after returning to work,and thus the effectiveness was evaluated in terms of students’ outcome. Continuous follow up study will provide a reference for improvement of future faculty development plans. Since the implementation of this project in 2011, many participating schools and teachers have made an effort to improve their curriculum and teaching, and their enthusiasm for education is very appreciated by students. More promotion activities will be conducted to facilitate more teachers to work together from multidisciplinary areas, and to share experiences from role model systems and excellent courses. The 3C stands for Citizens' Core Competence. And the shape of the letter “C” is also regarded as working hand in hand. With an image of thrive and prosperity, the flower pattern symbolizes the hope that seeds planted for education will bloom finally.